Aliso Niguel sohpomore Quinnlyn Mason has verbally committed to play NCAA Division I women’s lacrosse at UC Berkeley beginning in the Fall of 2018. Mason has been a starting varsity athlete since her freshman year. This weekend she scored 18 goals in three games to help the Wolverines win the Brine bracket championship at the Rose Bowl Jamboree. Mason has also played for the Orange County U15 National Team, the Orange County High School National Team, and West Coast Starz 2018 Gold out of San Diego. The Mason family shared their excitement for Quinn’s commitment to Cal with MaxLaxOC.com. Quinn, what deal making factor convinced you that Cal is the right place for you? -Academics are really important to me. Cal is the number 1 public university in the world and is ranked 4th overall according to the 2015 Academic Ranking of World Universities. I have traveled all over the country and visited many schools the past year with my club team. After attending the Cal Fall Lacrosse 7 v 7 Tournament last September and the Cal Winter Camp in January, Cal easily became one of my top choices. I was invited for an unofficial visit over President’s weekend. After meeting the team, touring the campus and athletic facilities, and getting to know the coaches even better, I realized that Cal was the perfect fit for me! What has your recruiting experience been like playing with Aliso and clubs, if any? My high school coach, Dave Elkins, encouraged me from a young age. Beginning the summer of 6th grade, he let me play with the high school girls during the summer league. He was my OC National Team Coach my freshman year and with two of his own daughters playing collegiate lacrosse, he was able to guide me in the right direction as I began the recruiting process. Rebecca Kingsbury is the director of my club lacrosse team — West Coast Starz — out of San Diego. She has been extremely helpful the past year guiding me through the recruiting process and helping with the communication with college coaches. She has been very supportive and encouraging throughout this whole process. What are you going to make of the rest of your high school career and what steps are you going to take towards college lacrosse in the near future? I am looking forward to a successful high school career and hope to help lead my team to a CIF championship before I graduate. There are so many talented girls on my team that motivate me to work hard on and off the field as a student-athlete. I am excited to see how we grow and succeed as a team in the future. I will continue to compete competitively on my club team throughout my high school years and hope to participate as a member of the OC High School National Team as well. I do additional training with Nick Tintle at Athlete’s Choice in Rancho Santa Margarita and feel that this training has definitely helped me achieve greater success as a lacrosse player. With the opportunity I have been given to play lacrosse for Cal, I want to do everything I can to become a better athlete so I can contribute as a strong member of Cal’s Lacrosse team. Mom & Dad, who or what do you have to thank for your daughter’s lacrosse and academic success so far? 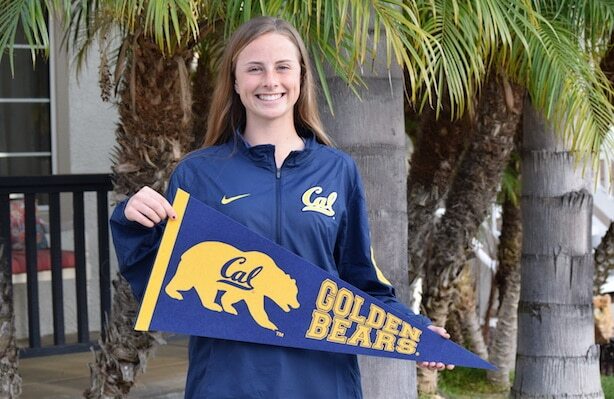 Words cannot describe our excitement for our daughter’s recent verbal commitment to Cal. We are so proud of her hard work and dedication, on and off the field. She is an amazing, confident kid with a great sense of humor. She is self-motivated and driven to give 110% in the classroom and on the field. She is loyal and respectful and has so much compassion for helping others. Lacrosse became her second passion after soccer and her success with lacrosse continues to fuel her desire to become a better player. We are so thrilled with the amazing opportunity she has been given. We are so impressed with the Cal coaches and program and look forward to watching her play D1 lacrosse at one of the top universities in the world!